Planning a baby shower and looking for a cute theme? 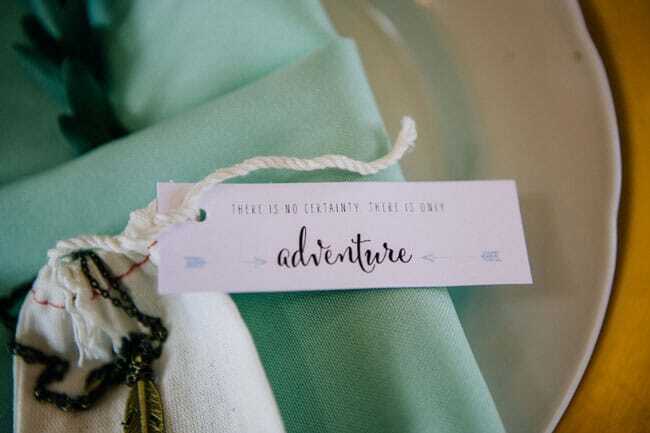 Check out the the details in this Woodland Baby Shower! A Woodland Baby Shower is a popular theme and we can see why. 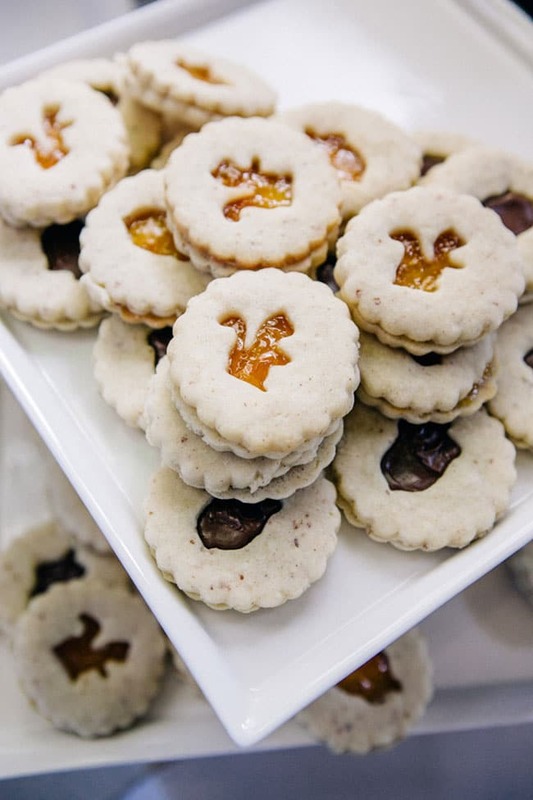 Who doesn’t love those adorable woodland creatures?! Not only is this Woodland Animals Theme great for a baby shower, but many moms-to-be have chosen this theme for their nurseries as well. 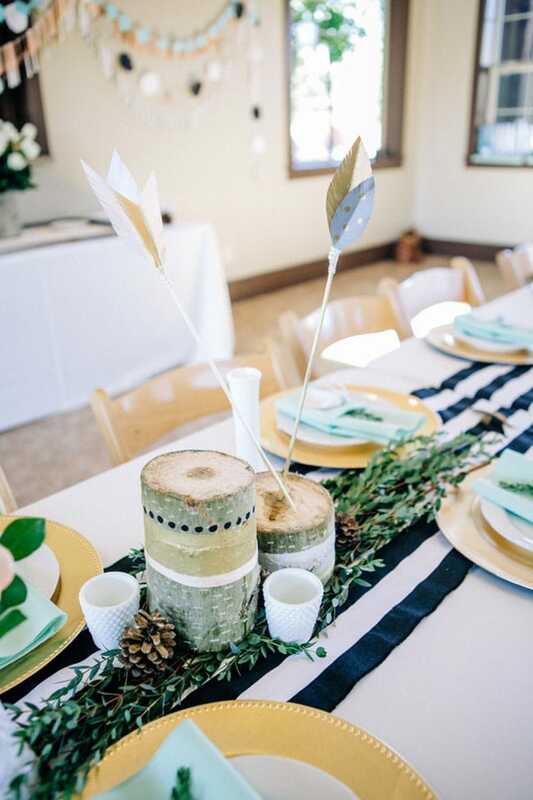 This Woodland Themed Baby Shower is so versatile and can be done either modern or rustic. 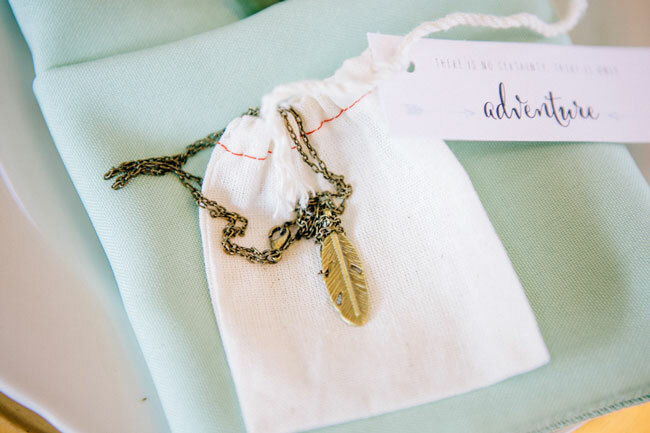 We love what they did here and created a modern boho vibe! 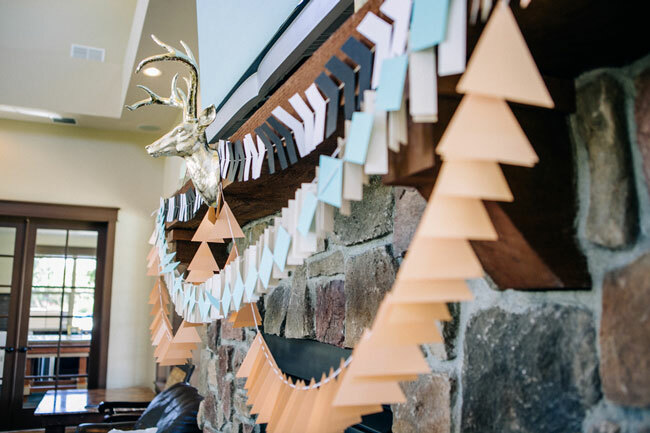 This Modern Woodland Themed Baby Shower provides the perfect inspiration for anyone planning a baby shower. 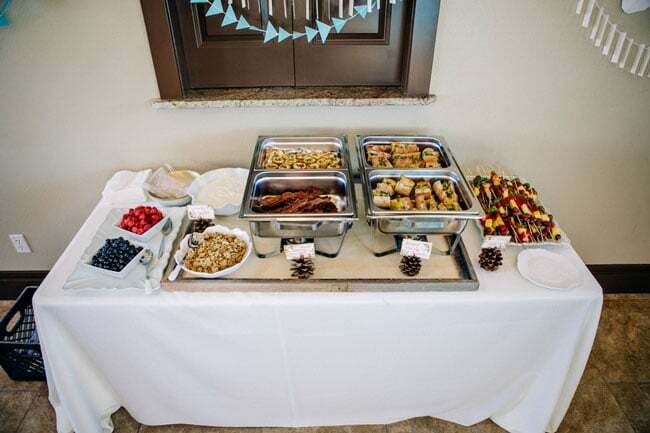 Everything from the decorations and cake to the food and table settings were stylish yet adorable. The theme was brought together perfectly with a little thought and creativity. The venue for this Woodland Baby Shower was perfect with its gorgeous stone fireplace and rustic details. 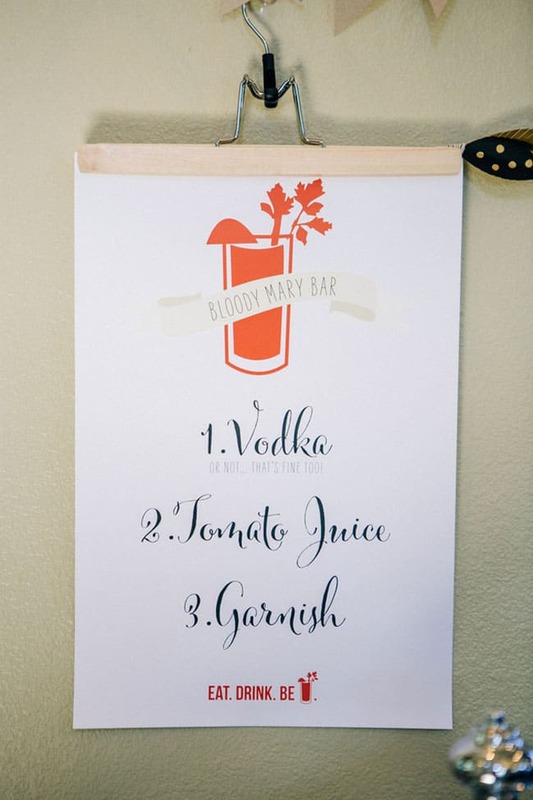 And to top it off was a fun Bloody Mary Bar! How fun! The adorable tribal themed baby clothes used as part of the cake table backdrop. 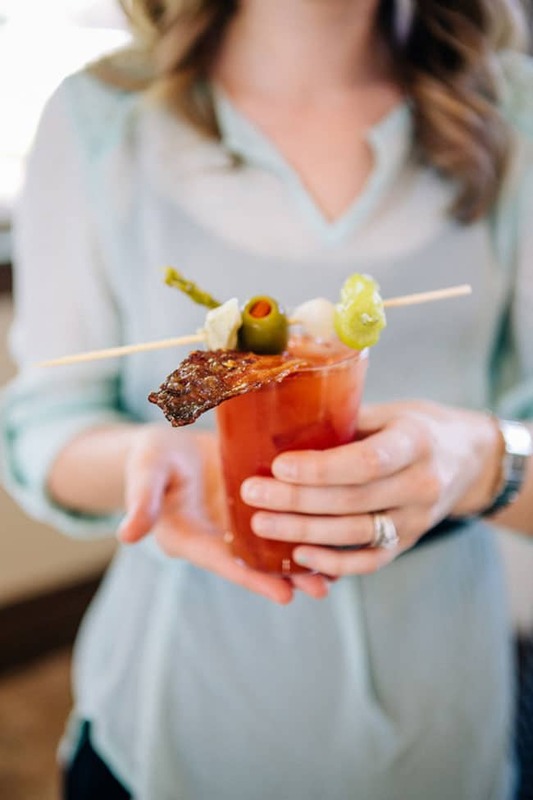 The awesome Bloody Mary Bar. The naked baby shower cake adorned with flowers and topped with a B for “baby boy”. The modern and stylish geometric and tribal inspired baby shower decorations. 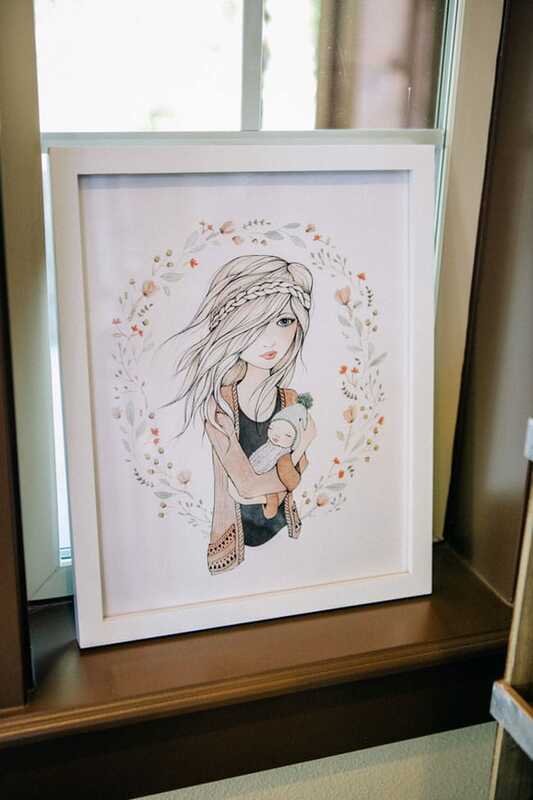 A framed drawing of mom holding baby which fit the baby shower theme. 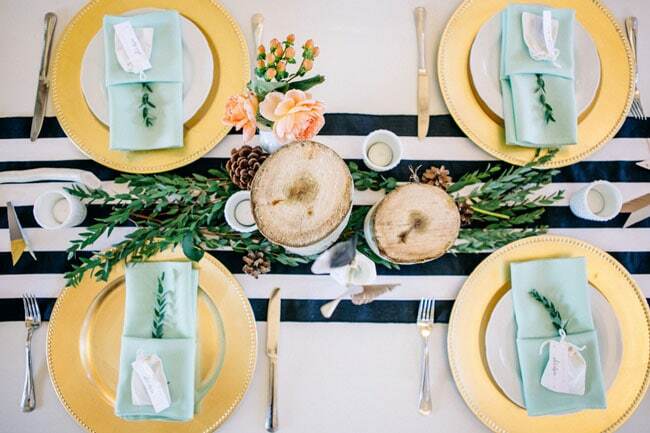 The stylish tables, table centerpieces and place settings. The wide open space of the venue allowed for long tables, which were set up in front of the gorgeous stone fireplace. 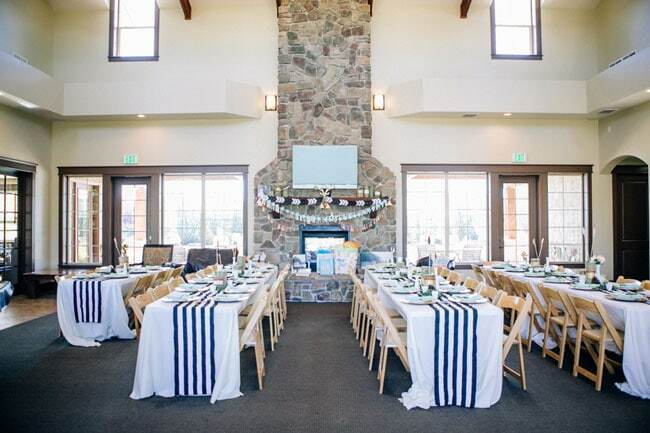 Navy and white striped table runners were the perfect added detail for this Woodland theme. 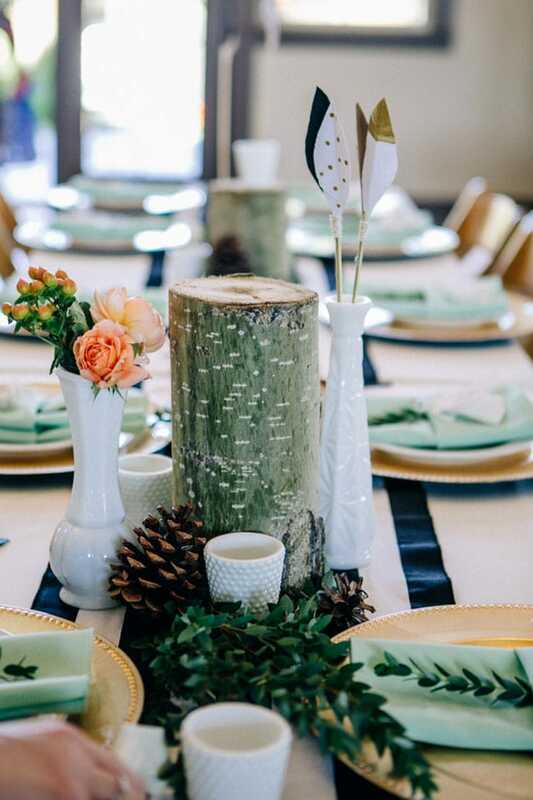 Table centerpieces featured pinecones, greenery, flowers, wood logs, and candles. 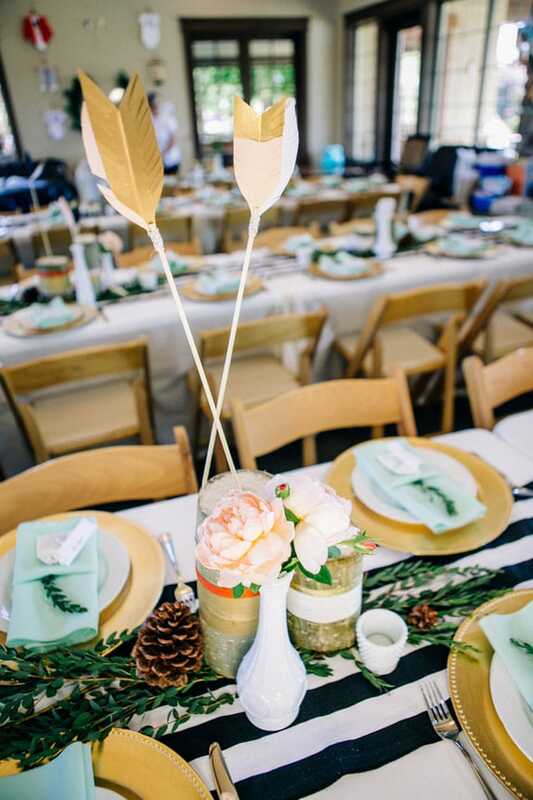 The table centerpieces went with the Woodland Baby Shower theme perfectly! How awesome is this drawing of mom and baby?! 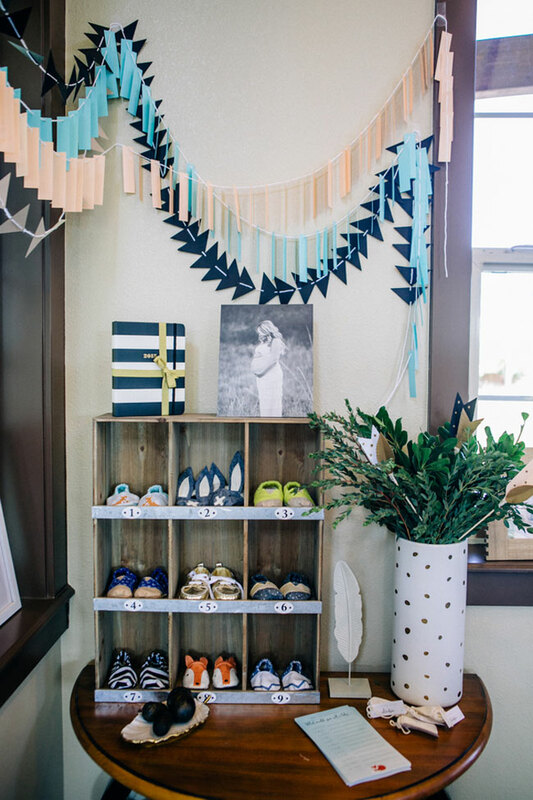 We love how it was framed and used as a baby shower decoration. It also fit with the tribal Woodland Baby Shower theme. Fun tribal-inspired geometric banners hung around the venue. Also included in the baby shower decorations was black and white photos from the mom-to-be’s maternity session. How sweet! 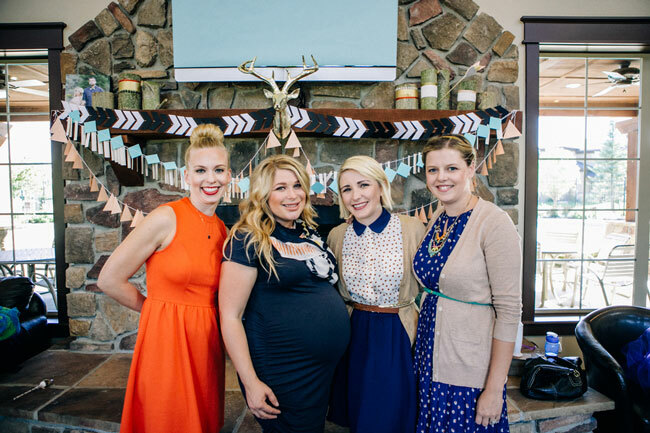 How gorgeous does the momma-to-be look in the photo that was on display at the shower?! Feathers and arrows were also added as decorations around the venue with a variety of white vases. 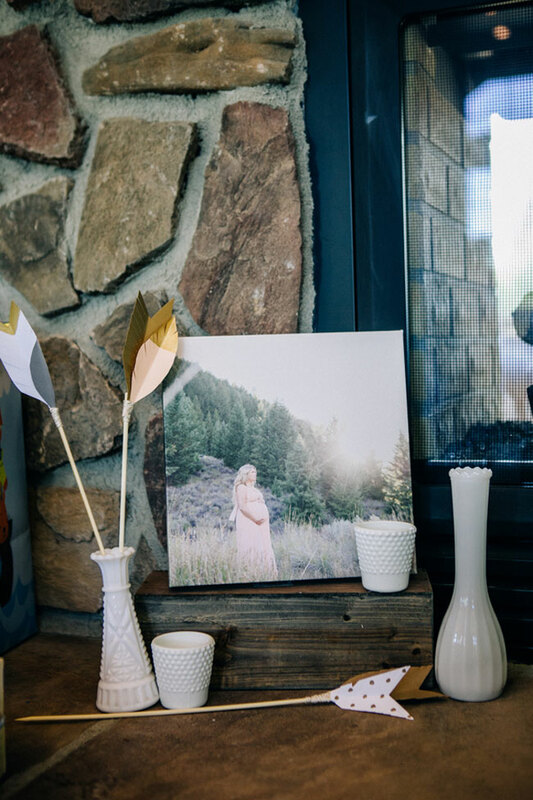 The gorgeous stone fireplace created the perfect focal point, so it was only fitting to decorate it with geometric and tribal-inspired banners, arrows, aphotos of the couple, and wooden logs. 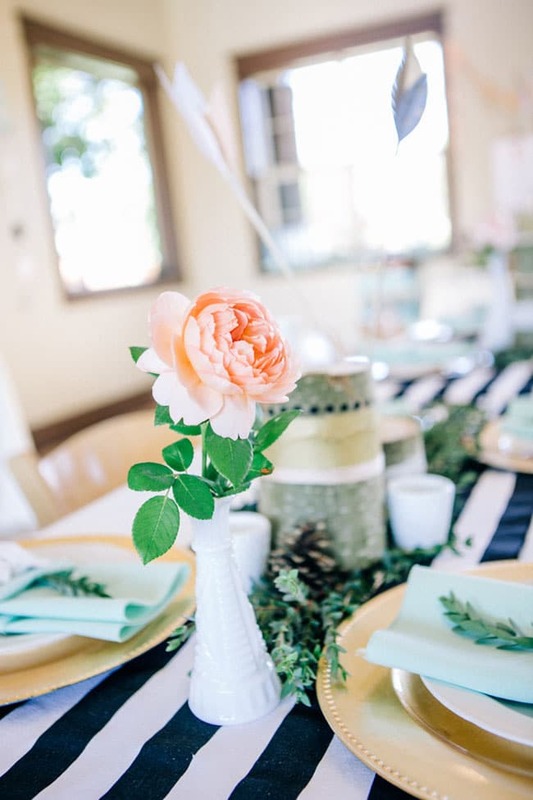 The decoration were perfect for this Woodland Baby Shower. The tables also featured peach flowers which paired perfectly with the navy in the table runners and gold charger plates. 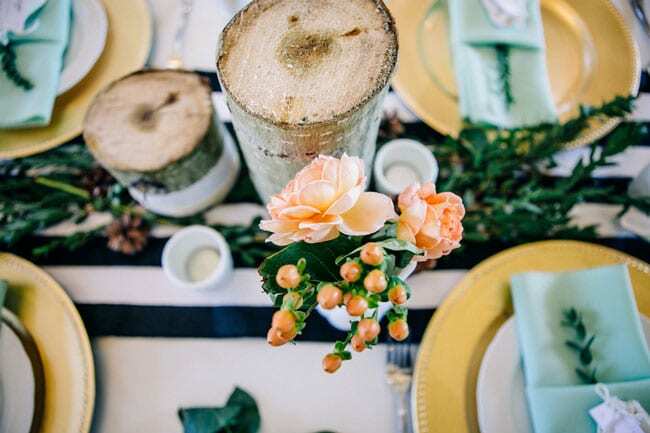 We absolutely love the color scheme of this stylish Woodland Baby Shower. 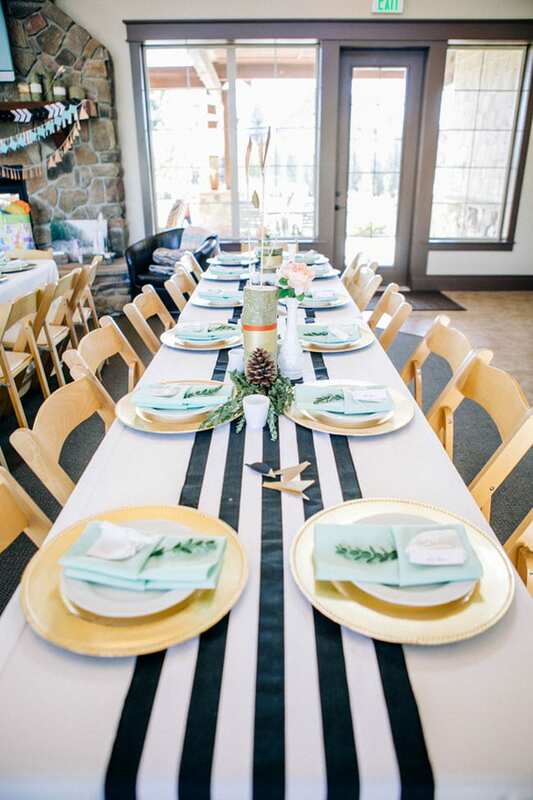 The tables at this Woodland Baby Shower featured wooden chairs which added to the great rustic vibe of the venue. But the planners of this baby shower glammed it up a bit and added some gold to the mix. 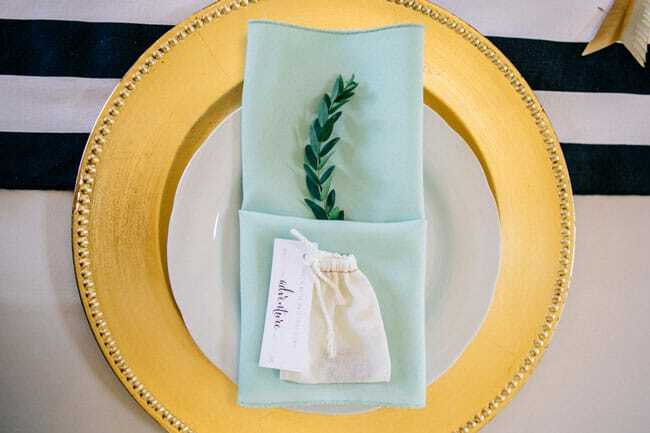 Table settings were gorgeous with every detail planned perfectly. 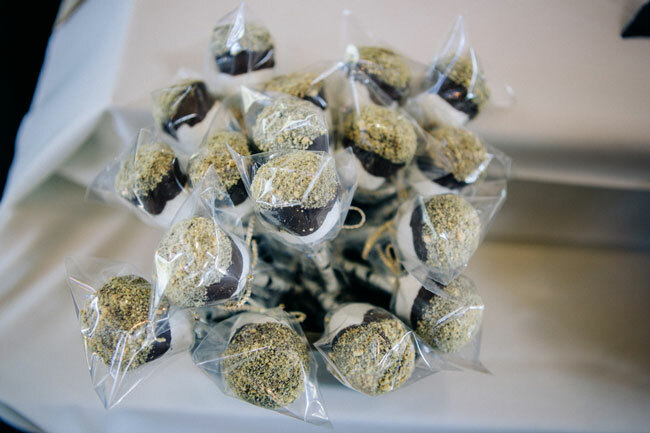 And with sweet, little party favors, guests were in for a treat from the second they sat down. 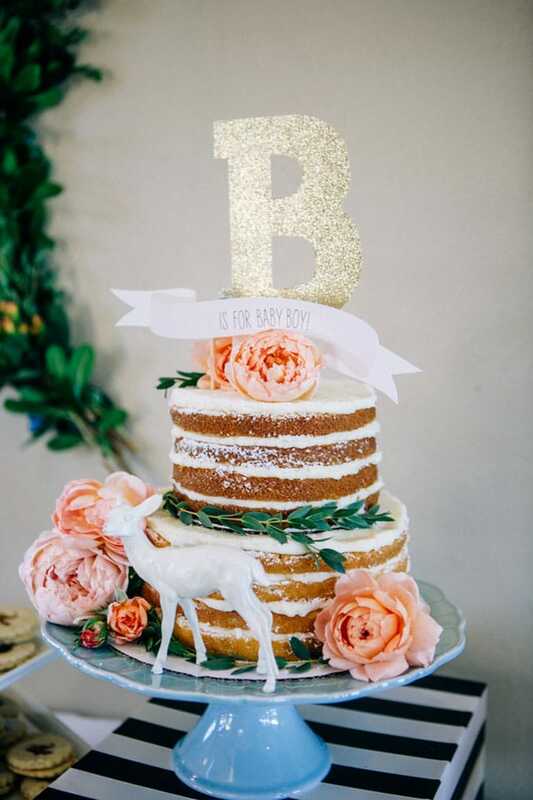 This magnificent two-tiered naked baby shower cake took on the rustic woodland theme perfectly! The gorgeous flowers were a perfect addition to the cake! And ho doesn’t love a gold glittery cake topper?! What a sweet Woodland Baby Shower Cake for sure! 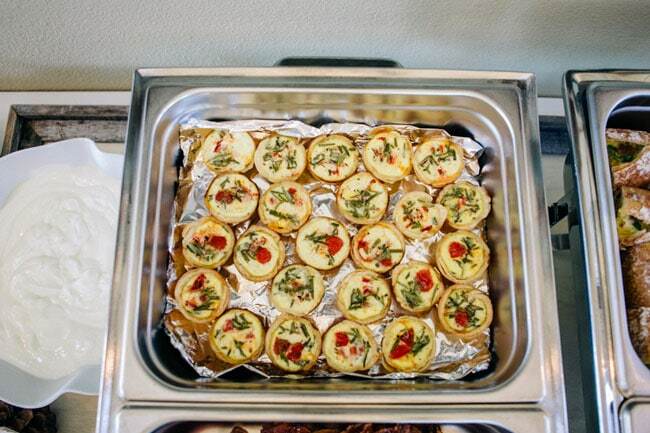 Desserts were on-point, with doughnuts, cinnamon rolls and cake pops. 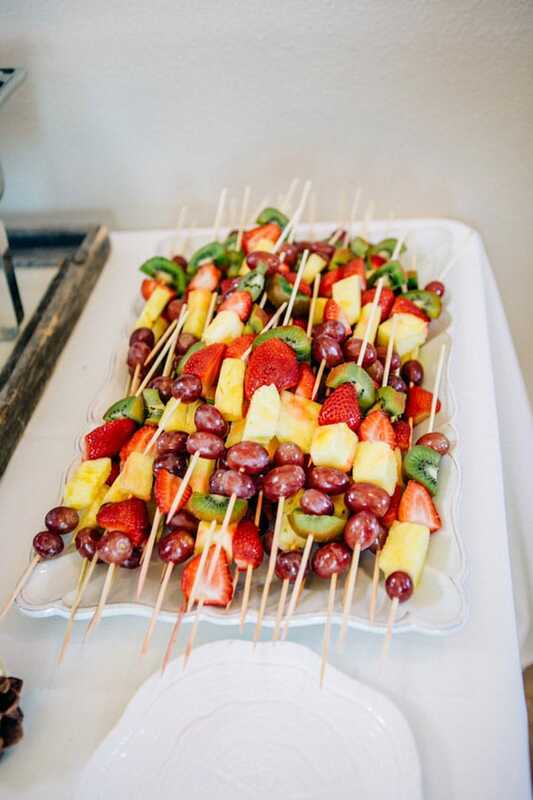 They were the perfect sweet treats for a sweet Woodland Baby Shower brunch! 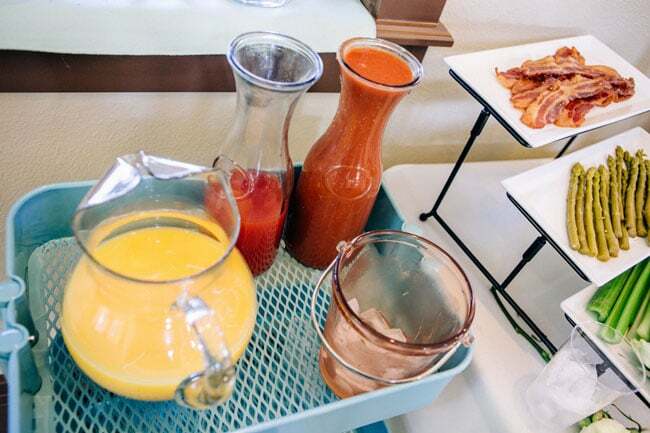 Guests were treated to an amazing Bloody Mary Bar where everyone was free to create their perfect beverage! 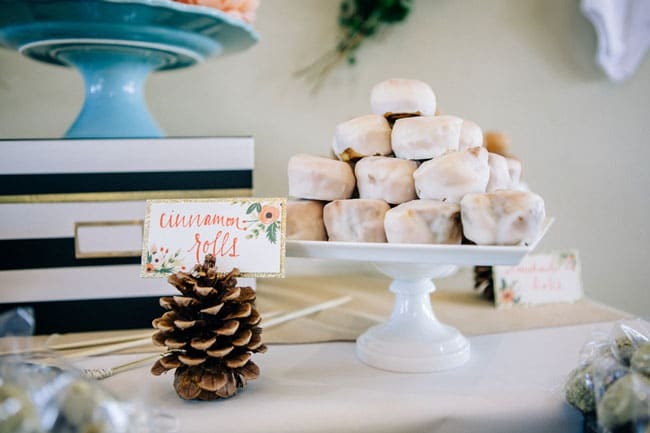 What a fun idea for any type of event but perfect for a Woodland Baby Shower! 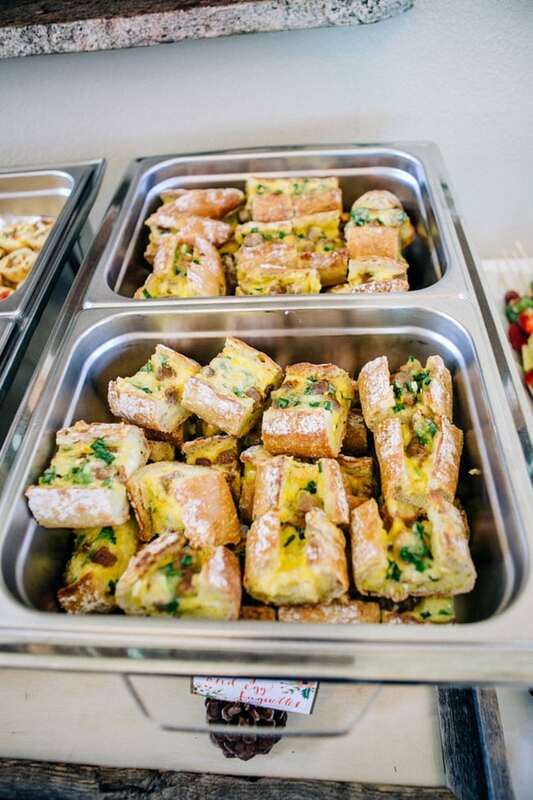 The delicious brunch had a lot of great breakfast items to choose from. 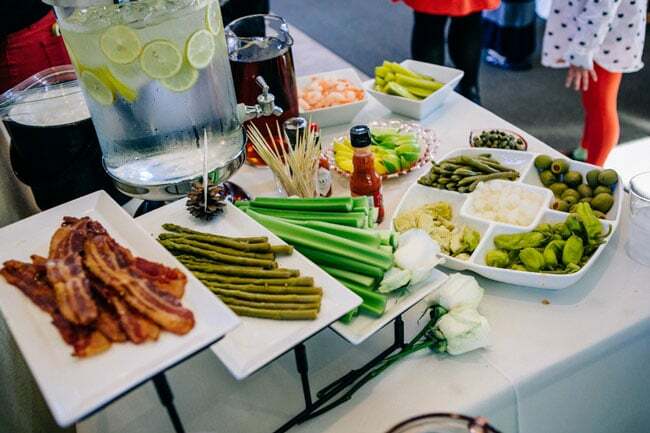 Nobody left the baby shower hungry, and the food was absolutely spectacular! 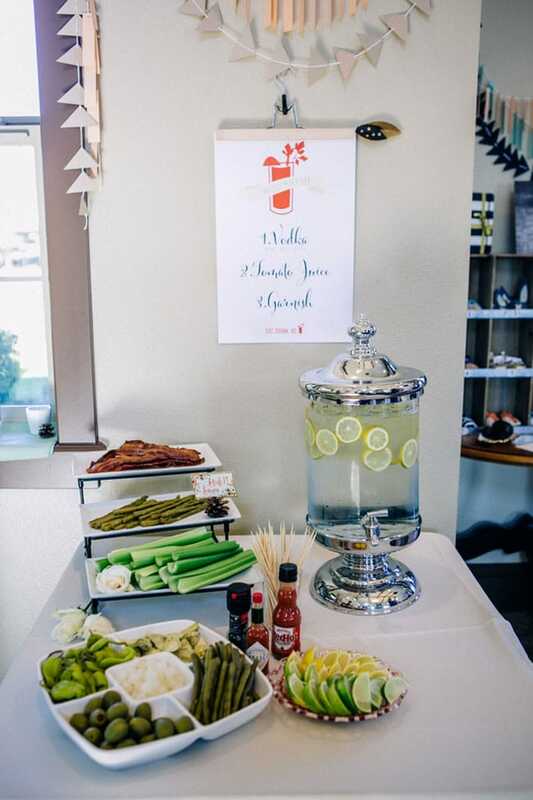 This mom-to-be couldn’t have been more blessed with a wonderful Modern Woodland Themed Baby Shower Brunch held in her honor. What wonderful memories to look back on! Wouldn’t this Woodland Theme would also be perfect for a birthday party too?! 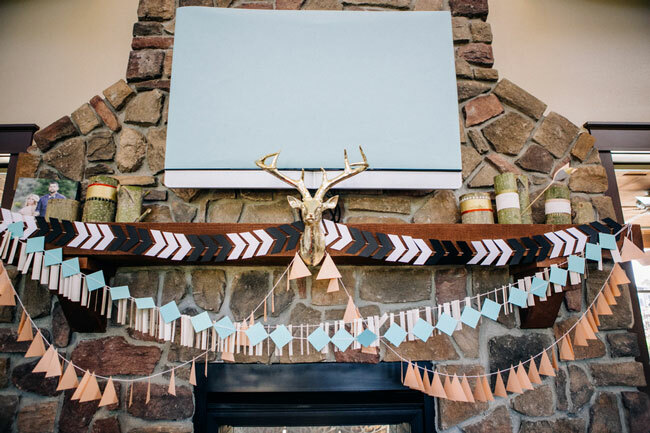 What’s your favorite detail in this Woodland Baby Shower? Let us know in the comments below! 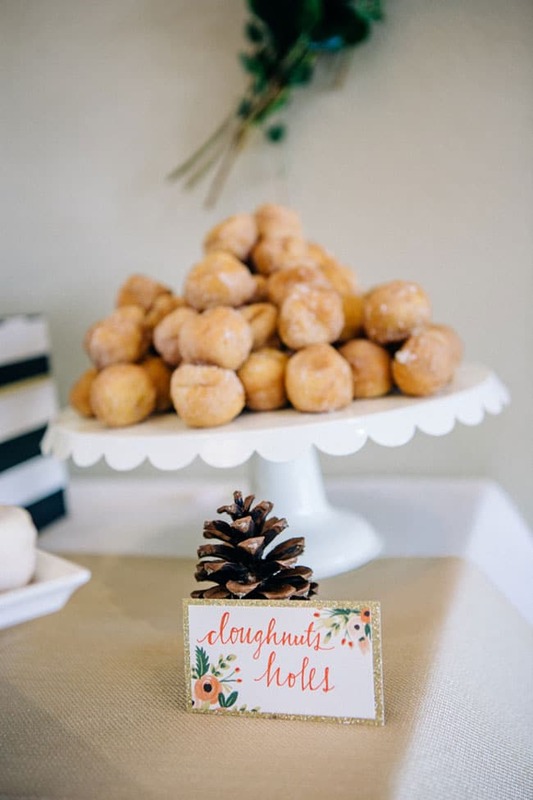 Can you please tell me where I can find the white deer figurine that is on the cake stand?